De Nederlandse vertaling is beschikbaar op deze link. After successfully raising €150.000 in 7 days we are now overfunding to reach the €200.000 for 10% of our equity goal. Read details about this in the 1.5 update. GoalGorilla is a digital agency. We design, develop and market websites and web applications. We are a established business working for a wide variety of clients. As of 2015 we have a €1.25 million turnover and have an expected profitability of 15%. Among a wide range of projects, the last three years we worked on social business communities. In 2016 we standardize this software and bringing it to a wider market. We call this software 'Drupal Social'. This is your chance to participate, and share in the success. What does our community software do? Our software empowers people to effectively collaborate and organize. Replacing traditional intranets, it fuels efficiency and bottom-up organisational innovation. The impact truly shines when you look at the business cases. Be sure to check them out below under 'Award winning business cases' and 'Achieved so far'. The software on a technical level: Drupal. Our software runs on open-source code, called Drupal, of which the latest and greatest version 8 has been released this November. You can see Drupal as a collection of tested and packaged functionalities. This allows us to build software faster. You explicitly invest in GoalGorilla, not in Drupal. We use Drupal in order to accelerate development, and will be contributing back to it's excellent developers community. The open-source nature of our offering is important to us. We decided to give credit where it is due, hence we choose to include the technology in the product name; 'Drupal Social'. "The Airbnb for volunteers. A global case with impact and great scalability. Beautiful platform to connect people. Interesting concept because the organisation is turned upside down and the community, of motivated volunteers is empowered. A case with great potential." * Heading image by Maurice Dekkers, for Emerce. - Saas and custom versions. Read more about this on the product section. This hybrid revenue model allows us to sustain cashflows during the development of our product in 2016, and therefore reduces financial risks throughout the lifetime of the investment. We are a team of 23 web professionals working from two offices in Amsterdam and Enschede. Among our clients are multiple multinational brands, but also a handful of fast growing (Deloitte Fast50 and FD Gazellen) Dutch start-ups. 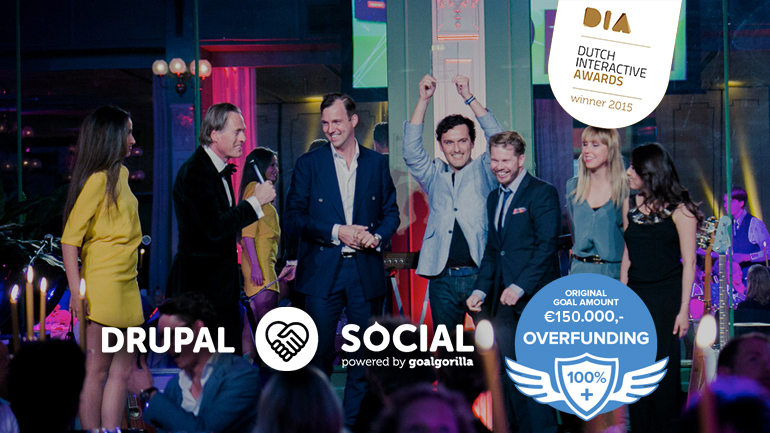 One of our projects, powered by our community software, has won the prestigious Dutch Interactive Award 2015. Our community software empowers 30.000+ Greenpeace volunteers to create a better planet, and help Dutch government to create jobs (in Dutch) much more efficiently. You can find an presentation of our agency in the attachments. We require € 346.400,- in order to rewrite our software and bring it to market in 2016. We fund this by raising € 150.000,- up to € 200.000,- in equity and in addition invest € 146.400,- up to € 196.400,- from our own assets. This investment is mainly for used for new staff (€215.000) and marketing (€108.000). You will receive shares in GoalGorilla N.V. through a cooperation. Our first funding goal is € 150.000,- in exchange for 7,5% equity. When we reach this first goal, we will add an over-funding round that will bring the total to €200.000,- in exchange for 10% equity. We are considering exit opportunities through further funding rounds and/or buy-back of shares. We project for a €8 million valuation at the beginning of 2019, which gives you a 300% return in 3 years. In addition, when liquidity permits, the shares will entitle you to a 5% dividend. Co-founder of GoalGorilla. More than 10 years of professional experience in data-driven marketing. Responsible for Marketing/UX for Drupal Social. Mieszko; "Seeing the strong business cases our community software creates I believe bringing this to many more organizations is a great win for the social software space and for Drupal in general." Co-founder of GoalGorilla. Extensive experience in social communities and social intranets. Board member at 'Stichting Drupal Netherlands' . Product owner for Drupal Social. Taco; "Drupal Social brings the best of open-source to social business software: the security and speed of innovation of a strong development community and the open nature to run it where and how you like it." Project Manager at GoalGorilla. Consulted on GoalGorilla's largest social software projects, including our award winning community. Scrum Master for Drupal Social. Evelien; "Creating effective teams in a growing company is a big challenge. I implement agile workflows and use scrum to maximize productivity and keep teams happy." Drupal Architect at GoalGorilla. 10 years of experience working with Drupal. Development lead for our award winning community project. Lead Developer for Drupal Social. Jaap-Jan; "The launch of Drupal 8 provides an unique opportunity and the ideal platform to rapidly rebuild and further improve our software offering." Interaction Designer at GoalGorilla. Professional Doctorate in Engineering in User System Interaction from Eindhoven University. Lead UI designer for Drupal Social. Xinyu: "Designing for a great user experience is very important for the success of digital products. People expect for fast, intuitive interfaces. I will brings this to Drupal Social." Cross functional team made out of 23 web professionals in Amsterdam and Enschede. Close to 2/3 of which will contribute to Drupal Social. Our software empowers people to effectively collaborate and organize. It fuels efficiency and bottom-up organisational innovation. That's why we focus so much on presenting successful business cases like Greenpeace Greenwire and Stad Scoort. - Tools to grow a healthy community. You get tools and analytics to grown your community. Software features don't drive success, a healthy community does! - Data ownership. You are in control of your data. EU customers keep their data the EU, USA customers keep their data in the USA. Simple. - Saas and custom versions. You can choose between fully hosted and 'on-premises' versions. Your organizational needs shape the software, not the other way around. We’ll provide enterprise services for our largest clients tailoring it to their unique set of needs. Later in 2016 you can buy a fully maintained SaaS version for a monthly fee per user. The software as a service (Saas) version of our software is highly scalable both on a product level and in business model. Our strategic marketing and sales efforts will focus on The Netherlands and West-Europe first. Expanding into the USA and rest of Europe, the Americas and further is the next logical step. Drupal Social is a distribution for building social communities and intranets inspired on our award winning social community platform. This platform is loosely based on Commons for Drupal 7. Drupal Social is a complete redesign and rewrite of this concept. We are focusing our efforts on creating a minimum viable product (MVP) within 3 months. We are running the project from this Drupal.org page. Our software is targeted at early-adopting organizations, that are replacing traditional intranets or their first generation social software products such as forums with communities. Our software is targeted at organizations with 50+ of such stakeholders. For our enterprise services an organization has to have €1 million yearly turnover or more. IDC, a premier market intelligence provider, estimates the 2014 market for Enterprise Social Networks at $1.4 billion annually. The enterprise social networks market is expected to reach $3.5 billion by 2019 at a compound annual growth rate of 19.1%. The online communities market is expected to reach $1.2 billion by 2019 at a compound annual growth rate of 24.3%. Our products replaces legacy intranets, usually hosted on premise with high hardware maintenance and licence costs. Our main advantage against the closed-source competition is clear data privacy and ownership options, and the lack of vendor-locking. Drupal’s leading company Acquia (currently on the IPO track) was named a 'Visionary' by Forrester in 2014 with it’s Drupal social software: Commons. But Acquia doesn't own the Commons software platform. Acquia layers a number of enterprise level commercial services on-top of the Drupal CMS. In fact, Drupal version 8 launches in Q3 2015 and Acquia will not make a new version of their Social Software ‘Commons’ in Drupal 8. “...there is some concern about whether the open-source community will keep up with expectations in this market...“. Gartner was right, when it comes to Acquia. But now, 2 years later, GoalGorilla has the ability to seize this amazing opportunity, put Drupal back on track and become a leader in open-source Social Software. "Gartner Magic Quadrant for Social Software in the Workplace 2014"
"The Forrester WaveTM: Social Depth Platforms, Q2 2015"
Both customers achieve amazing results with their communities, which will be a part of our sales pitch for Drupal Social. "Greenpeace Greenwire is increasing Greenpeace's reach and amplifying the power of our volunteers every day. By enabling people to self-organize and providing them the tools to coordinate, learn from each other, and share their ideas and stories, it provides a place to create remarkable campaigns and content, extending our reach far beyond the limits of our staff numbers and office locations. Greenpeace International Head of Digital Network & Mobilization. We are talking to multiple launching customers that our interested in our product..
We can disclose some of the details of these talks to investors, but only in private and under NDA agreement. A huge advantage compared to early stage startups is that at GoalGorilla we already have a team of experienced marketing staff to promote products and services. The management team has years of experience in sales and a business network in The Netherlands and beyond. For the first brand identity mock-ups, and online marketing research, see the attachment section. A big part of sales will happen online: we attract prospects through targeted advertising and engage them with the right content, at the right time. - Saas version: online marketing through organic and paid search, social media and referrals. - Enterprise version: existing business network and word-of-mouth, the Drupal community. We have a detailed plan on how much traffic and at which conversion rates we need to attract in order to meet our sales targets. The company’s turnover has grown steadily since our founding and first profitable year in 2008. In 2014 we won a FD Gazellen Award due to our 3-year historical revenue growth of ~35% each year and being profitable through all years. In 2015 we our profitability will be around 15% on a revenue of approximately € 1.285.000. In 2016 will invest heavily in Drupal Social. We will be working less on Enterprise client projects and therefore will see a small drop in revenues and profitability. See the 'Future sales projections - 3 years' attachment for details. This investment will start to show strong returns in 2017 and further, where we see a dramatic growth in recurring revenues and profitability. We require a minimal € 150.000,- through crowdfunding and offer 7,5% equity in return. When the first target is successfully met we will add a over-funding goal that will bring the total to € 200.000,- in exchange for 10% equity. In addition we invest € 196.400,- or € 146.400,- from our own assets. "I like the combination of investing with equity funds and own assets. GoalGorilla runs a healthy operation and management has thoroughly considered the investment timeline and forthcoming liquidity." Future investments and financing: We are looking into the possibility to raise further funding, preferably through lending, in the second half of 2016 in order to accelerate sales through marketing in 2017 and beyond. See the 'Cash flow coming 3 years' attachment for details. We will invest over a period of 12 months, creating a fully working, sell-able and lovable product. The main costs is new staff, consisting of three developers a projectmanager, and a sales staff. In total almost 4,5 new full time employees will be working on Drupal Social. The total Drupal Social team will be 6,6 full time employees, on average. But we don’t expect investors to cover operational costs for existing staff that also does other work. Neither do we use the investment for covering management fees. In other words: you only invest in the resources needed for Drupal Social. See the 'Investment plan (funds)' attachment for details. We are considering exit opportunities through further funding rounds and/or buy-back of shares. We project for a €8 million valuation at the beginning of 2019, which gives you a 300% return on equity in 3 years. In addition, when liquidity permits, the shares will entitle you to a 5% dividend. We calculate liquidity by using the quick ratio and solvency percentage. Company Valuation: we base our valuation on the DFC method, which is one of the most used models to value public companies. 1. The annual cash flows are weighted according to the country-specific survival rate for companies. 2. The calculated present value is further discounted by applying an illiquidity discount because the sale of the equity stake is likely to happen on the private market. As a consequence, investors need a higher return. "Calculations show [GoalGorilla's] valuation might be higher than the valuation offered on Symbid, which is good deal for investors. The full company valuation report is available in the attachment on the right hand side, you can find the DFC valuation on page 10. Current management will retain prioritized shares, and in 2016 GoalGorilla N.V. will offer employees the possibility to participate through equity. We view employee participation as a critical factor to retain talent in a increasingly competitive job market. See the 'Shareholders agreement' for details. We view entrepreneurship not only as a trade of taking risks, but as one of mitigating and minimizing risk. - Technology risk = delay in product release. We work with agile methodologies based on existing Drupal and GoalGorilla software.This greatly reduces the risk of not releasing on time. - Team risk = shortage of developers, under-qualified management. We already have a skilled team and attract developers through internships and targeted hiring. Management has proven track record running a growing and profitable business. - Market risk = gaining large enough market share. We have years of experience in successfully marketing online products. We reserve a big part of the budget for marketing. Successful business cases, and traction within the open-source community give us a higher visibility and attract prospects and clients. - Finance risk - Further investments needed upon success: build strong relationships with investors both informal and formal.